With the administrators being called into The Underwater Centre in Fort William, it leaves only 2 schools in the UK offering the HSE air diving courses. To this extent, we are experiencing a high demand for our courses for 2019 so if you want a place, please book well in advance. We only offer four courses per year and the first two (February & April start dates) are full with a waiting list in operation. The July course is 50% full as is September. It is highly unlikely we will run additional courses due to ongoing work commitments. The inshore industry seems to be steadily climbing onwards and upwards and we have seen some of our very first course graduates going on to take saturation diving jobs globally. 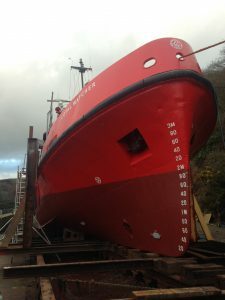 The ‘big red boats’ are now undergoing some minor refurbishment whilst the 10m hard boats are full steam ahead with inshore work for the next few months. Teams are working in Plymouth & Salcombe, both employing ex-graduates, some newly qualified, some now seasoned veterans! Our next course starts on February 11th. Course bookings are on the up and 2019 looks like it’s going to be a bumper year. Next on the list is Hambledon! Please email tamsin@commercialdivertraining.co.uk to register your interest. For those serious about a career as a commercial diver, the opportunity to visit us and undertake an open water dive in equipment actually used in industry is invaluable. A brief itinerary will be to arrive in Fowey or Plymouth, for 0800, transfer to the vessels for a briefing with instructors / supervisors. The cost of the day is free but it is intended for those who ae serious about a career within the commercial diving industry. For more details, please email tamsin@commercialdivertraining.co.uk. We will continue to post important news and updates on our website, but for every day updates, pictures etc please see our Facebook page www.facebook.com/commercialdivertraining which is updated more regularly.